← Counting the cost of being an Expatriate. I got my car back on Friday – my Jeep had been in the garage for four years, battery disconnected but sitting on all four tyres, so I had to get it serviced and have the MOT done. I thought it would need to be put on the back of a lorry to take to the service garage but the AA guy who came out to it pumped the tyres up and then tried the starter – started first time. We slowly took it into Nottingham and the dealer said he would put it in for its MOT the next day “then we`ll know what needs doing to it”. So I asked him for the million dollars, but he politely refused. Not only that, but after driving it around for a few days in silence I thought I would try the radio but it wasn`t the radio that played – it was one of my CDs. So I hadn`t lost all my music. I had the BeeGees. Woo-Hoo! And then, as I was tootling over to Lincoln yesterday I rested my arm on the armrest in the centre of the car and suddenly remembered it was a little cubby-hole when you lifted the arm rest up. Lo and behold – another ten CDs. And they were favourites, too, which is why they were in the car. So, not ALL of my wretched life had been knocked under the auctioneers hammer. And THEN (no – this is getting just too exciting for words!) I received an email from Barnes to say that as well as my piano, there were now “six boxes of assorted items” returned from the auctioneers including “kitchen crocks” and some “items of clothing”, so we will not be resorting to sitting naked on the floor, eating lunch off banana leaves as I had imagined. Quite disappointing really, the image quite appealed to me! Topping the list for poignancy is this picture – I mentioned it in my first post. 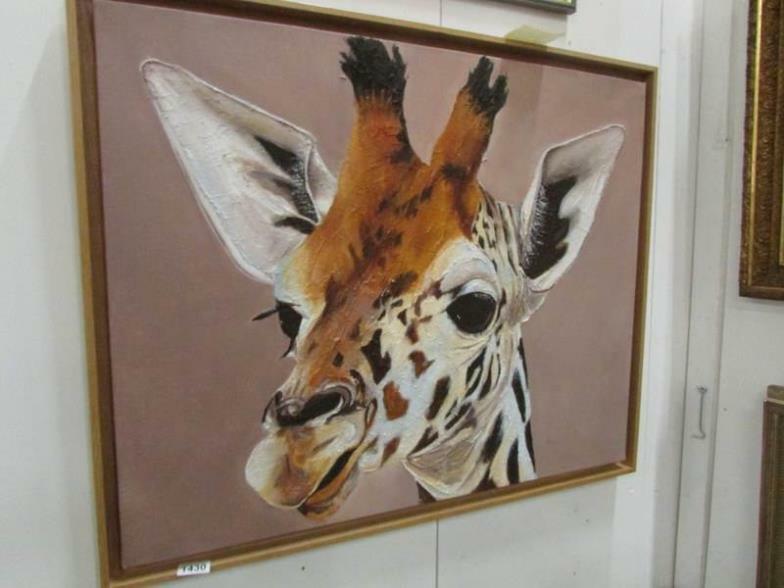 It was labelled in the auctioneer`s catalogue as a “picture of a giraffe, signed by Lea”. I wrote to him yesterday to point out that as far as I am concerned it is not just a “picture”. For me it is a portrait of Gertie the Giraffe. Tricia bought it for me on the very day of my 60th birthday when we were caravanning in France. It was Sunday and we went to a nearby posh restaurant for Sunday lunch – they do love their Sunday lunches on France, and so did we of course. Gertie was on the wall alongside another ten or so oils by the same local artist and, honestly I would have loved to bring them all home she had such a touch. They were all quite expensive but Tricia said “I know we agreed the holiday was our joint birthday present to each other, but I will buy you one of these for your birthday”. I just looked at her, amazed – but she could tell I really, really liked the paintings. And so did she, of course. We enquired of the Maitre D` about the prices of the paintings and he came closer and whispered the prices and indicated the artist was, of course, selling them just for cash and unfortunately they could not put the sales through the restaurant`s credit card. I suspect he thought maybe we could not afford the pictures, as he glided away to another table. Tricia said, “just a minute” and excused herself to the bathroom. She came back a few minutes later, beaming. “I didn`t want to count money at the table”, she said, “but I have got just enough in my purse to buy the picture you want.” So, Gertie became our friend and smiled at everyone who came to visit us at home. The particular poignancy of the loss, however, arises from the fact that as family and friends gathered at the house for Tricia`s funeral only just over a year later, Gertie was a focus for conversation about Tricia, making us all laugh and cry in equal measure. She has a special place in our hearts, that is for sure. Bang! GONE for £45, rather less than the bunch of Euros Tricia had quietly counted in the bathroom, just eight years ago. Next, a couple of unrelated items put together by the auctioneers, perhaps because they made him think of old fashioned motoring days of the pre-war period? A pair of binoculars and a car horn. In fact they were totally unrelated. The binoculars belonged to my maternal grandfather and undoubtedly they go back much further than the pre-Second-World-War period because I believe my Grandad Chapman bought them either at the very end of the 19th Century or the very early part of the 20th century because he LOVED going on family trips to the Isle of Man and such a pair of binoculars would have been invaluable for those trips. As far as I can gather from family tales he regarded the Isle of Man as his idea of Paradise. But, if you just bought the binoculars in an auction sale you wouldn`t know that, would you? May we have them back. As for the car horn – it is much more modern than you might think. I bought that when I was running a little old “frog-eye” Austin Sprite just after I turned 21. It makes a lovely huge “Honk” and I would sometimes use it for fun when we were at the seaside, in Cornwall for example and we had to get through narrow streets with lots of holiday-makers blocking the road. Totally unacceptable behaviour from the youth of those long-lost days. If I ever made you jump, let me apologise now, but driving with the top down was a fabulous memory to have and retain. Well, usually, anyway. Sometimes if I was driving back down to London to work after a weekend visiting Tricia in Lincoln and I was travelling faster than I should the soft top would suddenly flip back by itself. But the roads were rather less busy almost 50 years ago so it was never the problem then that it would be today. Bang! GONE two irreplaceable items, for a few quid. And, finally for today, an old anorak. And, here, I am not talking about myself! But I am talking about one of my possessions as a teenager. From the age of 14 or 15, I went on a number of school trips to the Lake District and the anorak my Mum bought me to keep me dry and warm was decorated with its first badge from Kendal. After that I bought badges from many places visited with school and with parents and pretty well anywhere that I enjoyed visiting and where they sold badges. It is, of course, unique. There may be 7 billion people in the world but I can pretty well guarantee no other single person has an anorak with just THIS set of badges on it – well, except that one other person now DOES have THIS anorak, since I do not, but I am willing to bet they have not visited all the places for which the anorak has badges. So there! It is a visual history of my early personal life and, as such, irreplaceable. Bang! GONE, maybe for five or ten pounds if there were a couple of people in the auction room who thought it an interesting curiosity. And it never was a piece of “scouting memorabilia” as described, since I was never in the Scouts, but I would like it back if someone out there sees it and knows who has it. I shall, of course, recompense the purchaser and come and collect it myself and share stories of the badges with you if it is YOU who has it. If you are interested and want to contact me about the anorak, or anything else you see here or think might be mine then please email me at keith.melton10@gmail.com or leave a message on my blog with contact details. I will do another posting soon with a few more unique glimpses into my past life and what I am still searching for! By the way, another glimpse onto the bright side of my life. I needed to print my letter to the auctioneer, to pluck at his heart strings and get him to help (Mr Woodcock , are you listening!) and so I brought the printer down from the locked office upstairs where it has been sitting unused for four years. Changed the black cartridge for a “new” one that had also been sitting in a drawer for four years and Lo and Behold! It printed first time of asking. Well done Hewlett Packard, a nice shout-out to you. And to Jeep Grand Cherokees, too – see above for that shout-out. This entry was posted in Antiques, Auctions, Genealogy, Life... and tagged Anoraks, Binoculars, Car horns, France. Bookmark the permalink.